There's not a pilot out there who doesn't love a good cross country flight. It's relaxing, but at the same time challenging, and when it goes to plan it'll give you a great sense of achievement. In this post you'll find out how to plan a long distance cross country flight, and I'll share some helpful tips to make sure the flight goes as smoothly as possible. Airspace: if there's airports, busy flight paths or restricted airspace, you'll need to find a way around it. Distance: you'll need to figure out the exact distance so that you'll have enough fuel for the flight. If the distance is too far you'll need to make fuel stops. Fuel burn: How much fuel does your paramotor burn per hour of flight? Speed: you'll need to know your average speed so that you'll know how long the flight will take. Landing options: you'll want to keep a landing option throughout the flight. Weather: check the weather along your route. Wind speed can vary considerably over just a few miles, and so can the conditions. 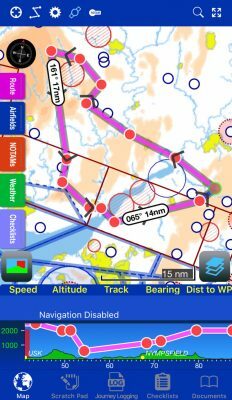 A great tool for planning your route is a free app called RunwayHD pictured above. This app will save you so much time when you're planning your cross country flight. We'll assume you have RunwayHD for the rest of this post, if not you can use sites like AirMap and FreeMapTools to calculate distances and to check airspace. Checking airspace and finding a way over or around it is easy with RunwayHD. You can set waypoints and drag them around to adjust your route. And you can set the altitude that you will need to be flying, at or between each of your waypoints. Don't forget to check the maximum / minimum heights of airspace, as you may be able to fly over or under it rather than going all the way around. The next thing to consider is the distance. RunwayHD will also help with this, as once your route is mapped out, it will tell you exactly how far it is in nautical miles. The app will let you set your fuel burn in litres per hour, and your average speed. It will then calculate exactly how long the journey will take. The app doesn't calculate wind speeds, so your speed, and fuel burn will vary, but the app gives a good rough guide. 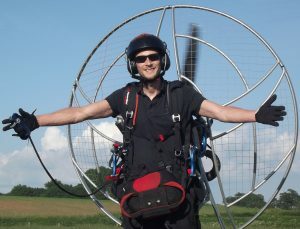 As with any paramotor flight, you should always have a landing option in case the engine quits. You can use the satellite view on the app, and zoom in to make sure you're not going to be flying low over built up areas, water, or busy roads. Leave this part of the planning until the day of the flight as the forecast will be more reliable. Look at the predicted wind speed and direction by using apps like Windfinder, but bare in mind that they're not always 100% accurate. You can then work out whether you'll have a headwind to battle against during your flight. If you discover there will be a headwind, you'll need to adjust the speed, duration, and fuel burn to suit. For example: using RunwayHD you set your speed at 30 mph, and your fuel burn at 4 litres per hour. It calculated that one section of your flight is 20 miles, it will take 40 minutes, and that you'll burn 2.66 litres of fuel. But, when you check the weather you discover that there's a 10 mph headwind for that section. So you'll knock 10 mph off your speed, to give you a top speed of 20 mph. This means that this section will now take you an hour to fly, so you will need an extra 20 minutes of fuel, which is 1.33 litres of fuel, or 4 litres total for that section. Always check the wind speed and direction before takeoff with an anemometer and a compass. If you discover that the wind forecast was wrong you will need to do some calculations, and adjust your route if necessary. You can also do this in flight if you find that you're not travelling as fast as you had planned. Many cross country flights will require fuel stops, and these will also need to be planned. One option is to refuel at a fuel station. Using google maps, you will need to find fuel stations that are on your route, and a place to land that is as close to the fuel station as possible. You may be able to arrange to land at another pilots launch field if they live on your planned route. 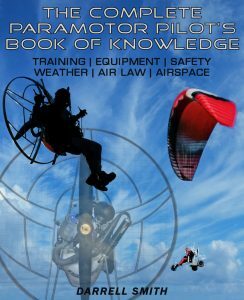 Many small airstrips will also be welcoming to paramotorists, but remember to call them to make sure it's OK to land there first. Many pilots will also spend a day travelling around and speaking to farmers and land owners to get permission to land during future XC flights. This way you can drop off a can of fuel before the flight, or get somebody to meet you there with a few litres. If you fly a 2-stroke paramotor, remember to take some oil with you to mix at the fuel station! When you have your exact route planned, you'll need to check the NOTAMs. You should already know how to do this, and you can use your usual method, or you can use RunwayHD. The app updates the latest NOTAM information as it loads up, and it has a simple NOTAM tab that you can open alongside your flight plan. Check NOTAMs when planning your route, but remember that new NOTAMs can suddenly pop up, so recheck them right before launch. Fuel check mirror: don't rely on guesswork, or the fuel meter on RunwayHD to predict your fuel burn. So many small things affect your fuel consumption, so always check it visually. It's impossible to see the fuel tank on many paramotors, so carry a telescopic inspection mirror LIKE THIS. Altimeter: you will have an altitude planned for most of the flight, and you may have to pass over restricted airspace, so an altimeter is essential. The altimeter on phone apps can be very inaccurate so get something like the micro alti. Flight suit: we all love flying in shorts and a t-shirt during the summer months, but even the hottest days will become very chilly at altitude. Wear a flight suit and a pair of gloves at the very least. Oil: if you're flying a 2-stroke you'll need enough oil to mix during your fuel stops. Pack small pots with the correct amount of oil for each fuel stop. Phone with apps or airspace map: we've already mentioned two of the best apps, but you can find my top 5 choices HERE. If you don't do apps, then an airspace chart is essential. Emergency contact: always plan for emergencies like engine failures for example. Tell somebody reliable your planned route, and tell them to keep their phone on, just in case you need a lift home. If you do have to make an emergency landing, land as close to a road as possible; trekking across fields with all of your kit is not fun, I've been there! Wing bag: always take your wing bag, even if you're landing back at the same field. If you have to make an emergency landing, you may have to walk a long way with your kit, it'll be much easier with a wing bag. You're going to be in the air for a very long time, so it's important that you do a very thorough pre-flight check. Check every nut and bolt right before launch, and give the wing a full inspection, checking the maillons and the lines. There's a full printable pre-flight checklist in my eBook HERE. Take some tools: some things that can put an end to your flight can actually be fixed very easily with basic tools. You won't have space for many, but carry the most popular size spanners, Allen keys, screwdrivers, cable ties to repair netting, etc. Flying low: always be very careful when flying low, or when coming into land at unfamiliar locations. Power lines can be very hard to see, so always do a reconnaissance of the landing zone before dropping down low. Headwind: if you find that your ground speed is very slow, try changing altitude. You'll usually find that the higher you go, the slower it gets. This isn't always the case, as sometimes increasing altitude will improve your speed. You'll want to find the lowest headwind possible to stay on schedule, and to minimize your fuel burn. Daylight: always aim to be on the ground half an hour before sunset. This will give you a bit of leeway so that you can find a suitable landing spot, or extra time to get home if you're running behind schedule. Ground track: even a light crosswind will change your heading, and you could find yourself a great distance away from each waypoint if you don't compensate. To correct this, choose a point in the distance at the next checkpoint, and keep your wing slightly into the wind, crabbing enough to keep you exactly on track. 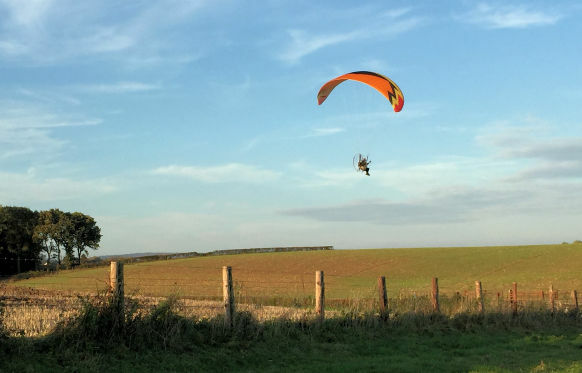 Ready for your first paramotor cross country flight? You're now ready for your first XC flight, but I'd recommend that you start off with a shorter flight of around 60 miles. Start by choosing various waypoints, and practice sticking to the planned route. Navigation is pretty easy on a paramotor, just because we're moving so slowly and we have a lot of time to do it; but you can still get lost without the proper planning or maps. Also, get to know how different conditions and wind speeds affect your fuel burn. You'll be surprised how much difference a 5 mph headwind will make, as will climbing and descending excessively. Take your time with planning, use everything you've just learned, and you will have some amazing cross country flights! If you're ready to get serious about cross country flying you'll want to get some instruments, so go HERE to find the top choices!